It’s almost time to say goodbye to Season 7, so make sure you jump in and complete those weekly challenges before time’s up. Fortnite Season 8 is coming soon and already we’re seeing changes around the map that point to something big. Season 7 of Fortnite has been extended by two weeks to account for the Christmas break. That means there are an extra few weeks to finish challenges, get those Battle Stars and level up your Battle Pass. The Share the Love event is now live and will run until February 27, just before Season 8 begins. There’s a new Competitive Series and Overtime Challenges to get stuck into, with lots of love-themed rewards. Season 8 is due to begin on February 28, the day after the Share the Love event ends. There will no doubt be a huge in-game event that you can take part in. As is the norm, there will likely be a massive in-game event to welcome in the new season alongside some major map changes. Fortnite’s map changes with each season, so there’s every chance a snowy corner will remain, though we could see other changes in different locations. Dataminers have uncovered files relating to an earthquake, meaning that areas of the map could be damaged or destroyed. We’ve already seen several changes to Loot Lake recently, or perhaps Tilted Towers will be destroyed for good this time. The event has been dubbed the Cataclysm by the community. Several players have already experienced the sound of the ground cracking and screens shaking while playing. The datamined information shows that around 50 tremors are set to affect the map between now and the start of Season 8, with a few happening each day. A volcanic eruption is also rumoured, which would fit in with the earthquake dynamic, but this has also been suggested before to no avail. It would be another means of melting the map quickly and we might be able to see the full castle that’s currently buried at Polar Peak. 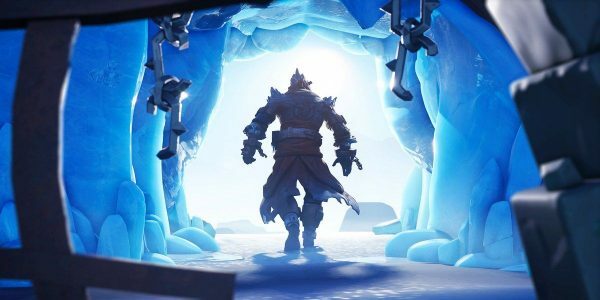 Some giant eggs were found under Polar Peak with some fans thinking that they’ll hatch some dragons, as Season 8 of Fortnite will be live on the run-up to the new series in Game of Thrones. Between potential fire-breathing dragons and an earthquake, there could be a massive shakeup of the Fortnite map that goes beyond revamping a single area or removing it altogether, like Moisty Mire. Swords have featured heavily in both Battle Royale and Save the World in Season 7, so a medieval theme for skins and weapons wouldn’t be amiss. We could also see the likes of rideable dragons in that case or the return of bows and arrows. The Prisoner skin challenges reward you with the Fire King at the end and it’s likely that he’ll have something to do with Season 8. He was locked away in Snowstorm Castle while the Ice King took over the map, and given all the dragon and volcano rumours flying around, we’re probably going to see more of him very soon. Players have reported seeing a light off the Northeast coast of the island, with the majority of the map thawed either side of that point. The Ice King and Sgt. Winter arrived with an icy armada, so it wouldn’t be a surprise if the Fire King’s army showed up in a similar fashion. We’ll be updating this page as more information about Season 8 comes to light. In the meantime, remember to check out the Overtime Challenges as well as the rest of Season 7’s challenges. The post Fortnite Season 8: release date, map changes, rumours and more appeared first on VG247.